The National Archives in Washington DC maintains military records from independence to the beginning of the twentieth century. Review what records we have available in our facilities in this Prologue article. When visiting Archives I, you are able to request the War Department’s Compiled Military Service Records (CMSRs) and the Department of Veterans’ Affairs claims applications (also called pension applications) and bounty land application files. Information needed includes the name of the soldier, his regiment, the state he served with, and the war that he participated in. To request claims applications, you’ll also need the application or certificate number. Some of this information can be gathered from the search engines of Ancestry, Fold3, and the Bureau of Land Management. Otherwise, you’ll need to come to the Archives to view the microfilmed indexes or order them online. Please note, for active pensions that continued to be paid after 1934 there will be a C- or XC- number. You should also check to see if the file has already been digitized on the National Archives Catalog. 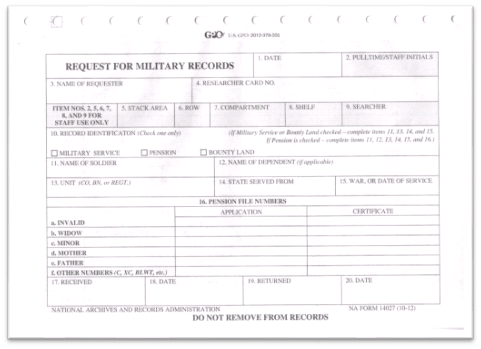 In the building, you will complete our quadruplicate “Request for Military Records” form (NA Form 14027). Regardless of which type of record you request you’ll need to fill out the top part of the form with your name, research card number, and date. Then you’ll complete sections 10-16. A request is need for each CMSR, pension, or bounty land application that you want to view. You’ll submit the form in our Microfilm Research Room after having it reviewed by a member of our staff. Pull times are the same as with regular records; Monday through Friday at 10, 11am, 1, 2, and 3pm. You can request four records at a time or twenty a day. Also, you should consider taking your records to the Innovation Hub to use NARA’s flatbed scanners for free scanned digitized copies. After your records are pulled, they will be waiting for you in the Research Room on the second floor. Remember to put your belongings in a locker before heading up to the room! Please note, records that have already been digitized, which includes CMSRs from the Revolutionary War to the Spanish-American War and Pensions from the Revolutionary War and later will not be pulled in order to preserve these fragile documents. Be sure to check on Fold3 to see what’s available before submitting your request. To submit your request online, visit the page “Requesting Copies of Older Military Service Records.” NARA does charge a fee for this service. When in doubt or if you’re confused, remember that the National Archives staff is here to assist you.